The WALK THROUGH VEST is worn on non-contact days. Perfect for “walk through” practices when players wear helmets and jerseys only. Offers protection for the shoulder and trunk areas of the body. Shock absorbent foam protects the body from incidental contact. 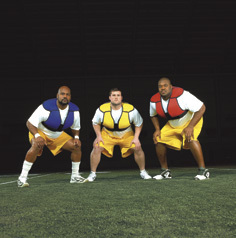 The vest is comfortable to wear and allows players to move naturally. An inner lining of blended polyester “wicks” the sweat off the body. Exterior tricot mesh allows moisture evaporation. Elastic straps with Velcro make it easy to fasten. Exterior label patch makes numbering easy. Available in three sizes. Specify size when ordering.